The government in Indian held Kashmir ordered internet service providers in the restive Kashmir valley to block social networking services there on Wednesday, an unusually harsh measure to counteract escalating waves of protests and violence in the region. In the order, the government notified internet service providers to block the transmission of messages on 22 social networking services, including Facebook, WhatsApp and Twitter, for a month, or until further orders were issued. The move illuminated a government increasingly vexed by civilian protests, by a newly budding homegrown militancy in south Kashmir and by a series of video clips, distributed on social media, depicting confrontations between civilians and Indian security forces. The order, signed by the principal secretary in the state’s Home Department, contended that social media was being used by “anti-national and subversive elements” for “vitiating peace and tranquillity” in the state. The internet is often restricted in Kashmir to prevent election interference and to quell protests and strikes, which often turn violent when police and security officers clash with civilians. From 2012 to 2016, it was blocked at least 31 times, the Software Freedom Law Center reported, often through mobile phones. But the scope of Wednesday’s order was far broader, reflecting the government’s determination to stem the anger of a population that is growing increasingly difficult to control. In recent days, the valley has seen angry protests from students rebelling against the heavy-handed tactics employed by the police and security forces in subduing demonstrators demanding greater autonomy or outright independence. On April 9, separatist leaders called for a boycott of a vote for a parliamentary seat representing Srinagar, leading to protests and clashes with security forces. Eight people were killed in the violence. After roiling student protests on April 17 in Pulwama, in south Kashmir, the government suspended college classes in the region for several days. 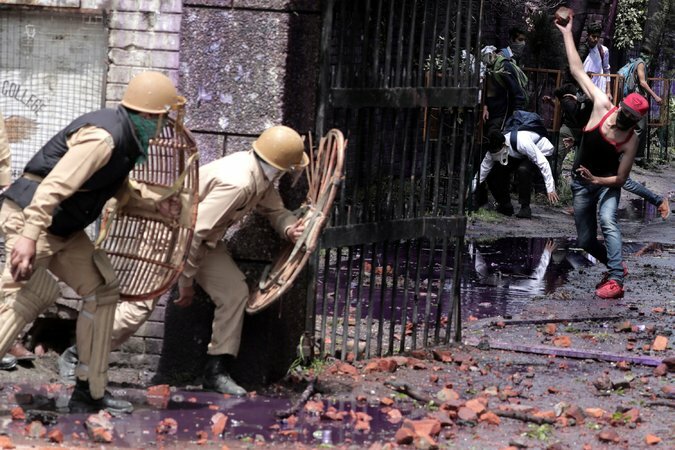 The protests have continued, however, and on Monday, students in Srinagar threw stones at security officers, who responded by firing tear gas into the crowd, local news media outlets reported. The unrest has put an uncomfortable spotlight on the state’s chief minister, Mehbooba Mufti, who runs the government alongside Prime Minister Narendra Modi’s Bharatiya Janata Party. She met this week with Mr. Modi to discuss the agitation. The tensions have been heightened this month by the wide circulation of videos showing what are purported to be abuses by the security forces. One shows soldiers beating a boy with sticks as he writhes on the ground. Another now-infamous video shows a young man strapped to the front of an army jeep and paraded around villages in the region, a caution to stone-pelting protesters. Others depict civilians pelting security officers with stones. Nitish Kumar, a senior police official, said in a phone interview that the order would help the police check the spread of rumors over Facebook and WhatsApp. “It will give us that time to manage the situation,” he said, calling social networking sites the “main platform” used by protesters. On Wednesday, young people in Srinagar spoke out against the order. Imran Arshad, a student at Sri Pratap College in Srinagar, the site of several recent protests, said that the government’s order would eventually fail. By Nida Najar on Twitter @nidanajar.